When the Scriptures are read in Church, God himself is speaking to His people; Christ, present in His own word, is proclaiming the gospel. The readings of God’s word make up a principal element of the liturgy. Readings are to be delivered in a loud and clear voice, corresponding to the solemnity of the gathering. The liturgy of the word promotes meditation. For this reason, any kind of haste must be avoided. Brief moments of silence are appropriate for the Word of God to be taken into the heart by the fostering of the Holy Spirit. Such moments of silence are observed after the first reading. After the opening prayer, the lector goes to the foot of the sanctuary and makes a slight bow, then proceeds to the ambo and proclaims the first reading from the Lectionary already placed there before Mass. At the end, the lector makes the acclamation, The Word of the Lord, with all responding, Thanks be to God. 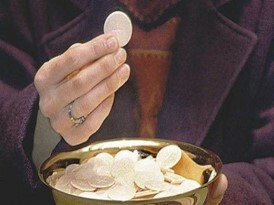 For the daily Mass a brief period of silence is then observed, so that all may meditate on what they have heard. The lector recites the psalm verse and the congregation makes the response. After the priest gives the introduction to the General Intercessions, the lector may announce the intentions from the ambo.